When you arrive in Hyères (by land or by air), you feel pulled towards the sea. 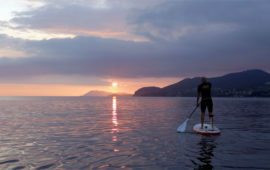 You’ll want to go to the islands, taste the open spaces, … to set sail (as they say!) You will be captivated by this incredible, dark azure blue. 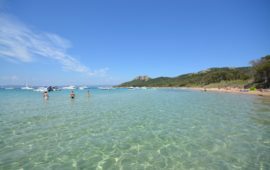 From Porquerolles to Port-Cros, from diving to snorkelling or just a swim in this crystal clear sea, discover the waters of this unique National Park! Coming from Hyères, you will be able to enjoy all the sustainable development that has been carried out over the years at Port-Cros National Park. Before setting sail, it is important to understand the high level of protection that the islands and the surrounding sea benefit from. Port-Cros National Park, created in 1963, was the first land and marine national park in Europe. There are two hearts to the park, Porquerolles and Port-Cros islands. These are playgrounds which need to be respected and protected. A favourite stopover for migrating birds, the area is also home to a few endemic land and plant species. The marine habitat gets its originality from the aquatic landscapes which are specific to the Mediterranean such as sea grass and posidonia. It’s time for you to go to sea. Go out for a whole day to some exceptional places. There are several ways of doing it. You could just rent a boat and let your captain for the day do all the work. 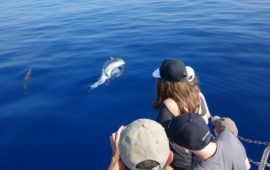 Here are two examples of excursions into National Park waters with two distinct (but not so different) programmes. On this day at sea, you will see secret beaches which could easily be in the Caribbean. The rigid-inflatable will drop you off in unbelievably pretty criques, little inlets with turquoise sea beds and crystal clear water. The boat arrives in the transparent waters of the Var coast. The La Londe, Port-Cros and Porquerolles will be the climax at the end of the day. Cap des Mèdes, Notre-Dame beach and other treasures which, we are not going to reveal entirely, will remain “anchored” in your summer memories. Such a lovely day. A different ship. A different pace. The Brigantin is a former tuna boat which has been converted and maintained with passion to take you off to the golden islands in a light, caressing breeze. This old rig, nearly twenty metres long, will transport you to places which are as famous as they are magic: Giens peninsula with its wild criques, Porquerolles and many other pearls of the South. The day’s programme is simple: take full advantage of the big blue, go swimming, eat on board drifting gently towards the sunset. We have to talk about the undersea paths when we are on the subject of National Park waters. 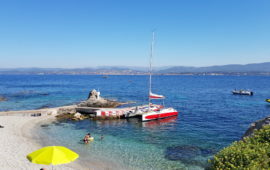 To discover the marine world of the Giens peninsula, Porquerolles or Port-Cros, all you need is to know how to swim with fins, a diving mask and snorkel. You’ll be able to observe protected sea-bed areas, populated with a multitude of fish and aquatic plants. The most famous of these paths is at la Palud beach, on Port-Cros island. You’ll be able to learn and recognise the different species you come across thanks to 6 buoys fitted with underwater information boards. All the secrets of the Mediterranean will be revealed. The la Palud underwater path at Port Cros. Information boards are installed underwater.